Easy, healthy, and delicious - this sweet potato wild rice with cranberries and walnuts recipe has it all! Wild rice blend contains more protein than white rice, not to mention dietary fiber for smooth digestion. Sweet potatoes are full of nutrients, including beta carotene, ascorbic acid, manganese, and all B vitamins. Cranberries, on the other hand, add their pleasant sweetness to this dish as well as essential vitamins and minerals needed for the immune system, metabolism, and blood sugar regulation. Walnuts offer omega-3 fatty acids for strong hearts and healthy cholesterol levels, making this wild rice recipe a nutritious and balanced meal. While the rice is cooking, put the skillet on medium high. Add the olive oil and onions and cook until translucent. Add the garlic and cook for about a minute, stirring so that it does not burn. Then add the sweet potato cubes, mix with the onions and garlic, and lower the heat to medium. Cook until the sweet potato is tender, about 10-15 minutes. Add the thyme and stir it so that it releases its fragrance. Then add the walnuts and cranberries. If you like a little heat, add a few thin slices of the yellow chili pepper. Season with salt and pepper to your liking. Give everything a good stir and cook together for another 2-3 minutes. Garnish with fresh parsley and serve warm. Enjoy! 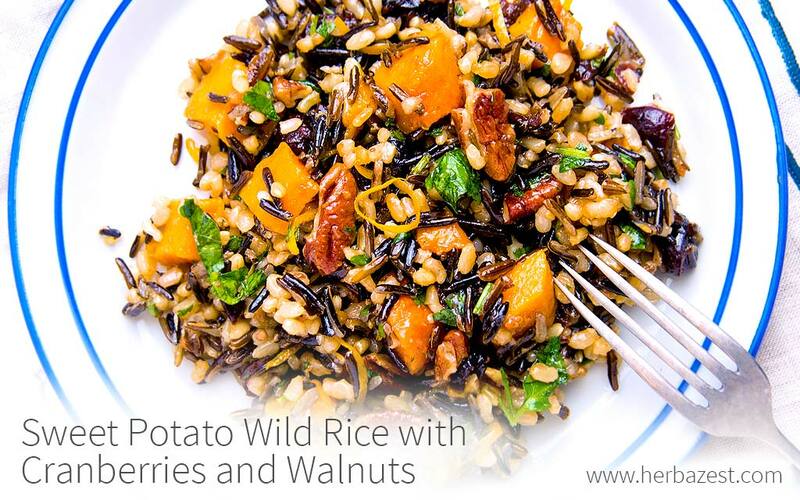 This sweet potato wild rice with cranberries and walnuts is delicious on its own or accompanied by protein of your choice. It is a great healthy dinner idea and a wholesome lunch for the following day.